Attention service providers! Community health workers! Educators! Medical professionals! Youth! National HIV Testing Day is coming up, and we’re leading the discussion about youth HIV prevention and sexual health through #YTHHIV, a live tweetchat hosted by YTH (@YTHorg) on Tuesday, June 23 from 10–11am PT. According to the Centers for Disease Control and Prevention, 1 in 4 new HIV infections occur among young people ages 13-24. Yet over 50% of young people with HIV don’t even know that they are infected. HIV prevention efforts have made a great impact on HIV/AIDS throughout the United States, but a great amount of work still remains to be done. 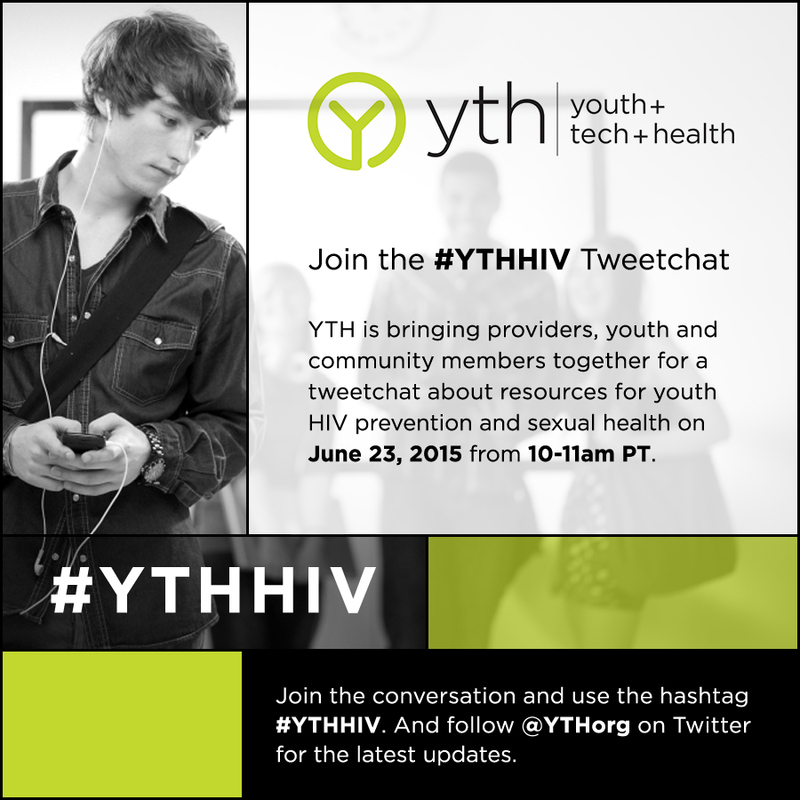 We’ve got three great organizations co-hosting the #YTHHIV Tweetchat. Positive Women’s Network (@uspwn) is a national group of women living with HIV that works to reduce stigma and provides support for other women living with HIV in the United States. YAHAnet (Youth, the Arts, and HIV/AIDS Network) (@YAHAnet) is an online network and how-to platform for improving the sexual health and rights of young people through the arts. The National Alliance of State & Territorial AIDS Directors (NASTAD) (@NASTAD) works to strengthen HIV/AIDS expertise and advocacy at the state government level. Using the hashtag #YTHHIV, our co-hosts, along with HIV experts, organizations, and others will have a virtual discussion about HIV prevention, testing, and education for youth. Panelists and participants will discuss a broad range of topics including tips and best practices for raising awareness of HIV transmission and testing for young people. Other topics of conversation will include diversity and inclusion in pro-health movements and youth-specific HIV services. The chat will focus on broad themes of prevention and education, with sub-topics such as testing, prevention, healthy living with HIV, and messaging in youth-geared initiatives. Interested in participating? Mark your calendars for Tuesday, June 23 from 10-11am PT and follow @YTHorg on Twitter. Join us at #YTHHIV with your questions and resources. Tweet you there!